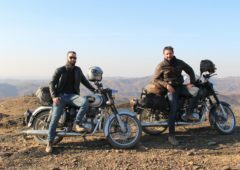 A Royal Enfield trip at Lake Baikal is the ultimate expression of liberty. Head to southern Siberia for a special encounter with the oldest and the deepest lake in the world. Lake Baikal represents 20% of the global volume of freshwater in the world. Recognized as a UNESCO heritage site since 1996, Baikal’s size is equivalent to that of Belgium. Its crystalline waters are surrounded by an extraordinary natural context, in the heart of the Siberian mountains. Unreal landscapes, purity of the elements… Come to venture on the banks of an authentic and welcoming Siberian coastline. 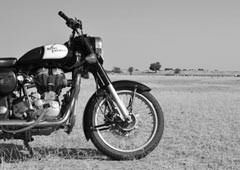 Set off on an exciting motorcycle adventure to discover this wonder of nature with a thousand legends. Riding a bike on a frozen lake is the dream for all bikers looking for a thrilling experience. Embark on an exceptional adventure to face the beauty of ice-covered landscapes and harsh climatic conditions. 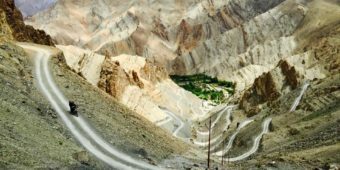 You will go to the heart of gentle terrain and steppes dotted with immense rivers. In the isolated hamlets and cabins around the lake, you will meet very hospitable people, always ready to receive the tourists passing through. 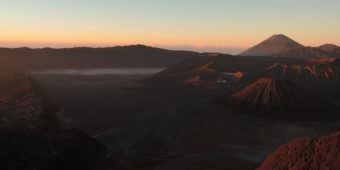 Launch a new challenge for yourselves and get ready for a trip of a lifetime. On the agenda: surpassing your limits and unforgettable encounters. When should one travel to Lake Baikal in Siberia? To undertake a motorcycle trip at Lake Baikal in Siberia, the ideal time to travel is winter, when the lake is frozen. Winter in Baikal is harsh. It is cold but dry and the days are very sunny. This region in southern Siberia gets 2500 hours of sun per year on an average. Far from the sad image of winter, in Siberia, this season reveals Lake Baikal’s landscapes and its beauty. Baikal, also called the Pearl of Siberia, freezes at the end of January. The best season is between late January and late March. 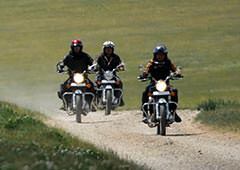 Our motorcycle tours on the ice take place in this period, ideally in the month of March. At this time, the ice is the thickest and the safest; we can ride a motorcycle on it without any fear. The thickness of the ice varies between 70cm in the southern part of the lake to more than one meter in the north. The ice surface is not uniform; one can see beautiful transparent ice spaces, swept by the winds and at other places, snow-covered areas and crevasses formed when ice plates collide with each other. Siberia, the “Sleeping Land” occupies more than 75% of the Russian territory. During a motorcycle trip at Lake Baikal in Siberia, you can venture into the southern part of Siberia. Siberia is surrounded in the South by Kazakhstan, Mongolia and China and in the north by the Arctic Ocean. It extends from the Ural in the West to the Pacific Ocean in the East. 23% of the Russian population lives in Siberia. A few nomads and breeder families live close to the Lake Baikal. The city of Irkutsk is a city situated on the banks of Angara, at a few kilometres from Baikal. The distance between Irkutsk and Moscow by train is 5192 km, that is, around 4 days of travel by the Trans-Siberian Railway. Lake Baikal is 636 km in length and around 80 km in breadth. At the end of winter, a strong movement of ice occurs on this transparent ice pack. Pieces of ice emerge in a chaotic manner, forming small mountains in the form of stalactites and stalagmites. The transparency and the clarity of the ice make it possible to see the dark depths of the lake. The thickness of the ice is difficult to measure with the naked eye. 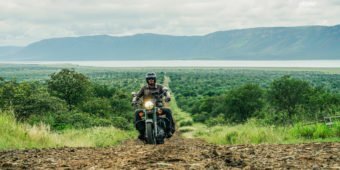 During your motorcycle trip at Lake Baikal in Siberia, you will discover the history and the culture of this isolated region. The history of Lake Baikal is mixed up with the history of the conquest of Siberia by the Russians. In the 16th century, Siberia became a Russian possession. The deportation of criminals in Siberia started towards the end of the 16th century. Later in the 17th century, the Russian government encouraged immigration of Russian peasants. The influx of migrants led to the construction of the railways used by the famous trans Siberian train today. Over centuries, these lands have been home to several tribes who left their imprints and conferred a spiritual power to the lake. Around 50 000 persons live near the lake. Baikal was declared a UNESCO world heritage site in 1996 for its ecological richness. Several animal and vegetal endemic species live in harmony here. Fishing is carried out throughout the year. 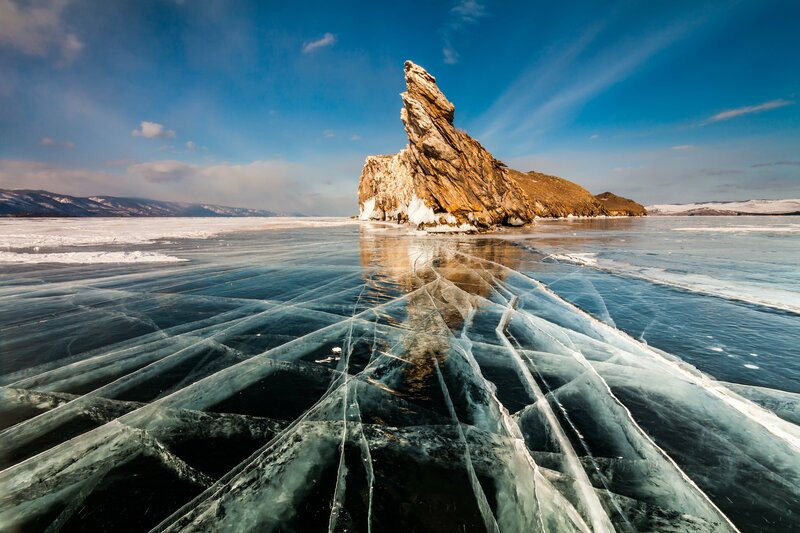 In winter, the fishermen drill a hole in Baikal’s ice. Its waters have a lot of fish and are reputed for sturgeons, which form the basis of the famous caviar. From the month of November onwards, all the fishing and scientific expedition boats are blocked because of cold weather in the ports established on the Lake Baikal. With the melt-down in May-June, the traffic resumes.